Bandar Seri Begawan, 30 August 2016. In a move to further support local SMEs with their entrepreneurial endeavours, Baiduri Bank hosted an event today to officially launch its latest service, the MerchantSuite. The event was held at the Radisson Hotel. The launch was officiated by the Minister of Energy and Industry, Prime Minister’s Office, Yang Berhormat Pehin Datu Singamanteri Colonel (Rtd) Dato Seri Setia (Dr) Awang Hj Mohammad Yasmin bin Haji Umar, the guest of honour for the event. Under the care of the Business Banking Unit, the MerchantSuite is a suite of solutions to enable SMEs to elevate their businesses by providing an affordable online platform to conveniently issue invoices and accept card payments. The suite complements an SME’s social media presence and does not require the setup of a website, which may get costly for entrepreneurs starting a business. On top of allowing users to accept card payments securely, in line with Baiduri Bank’s commitment to providing the highest industry standard in data security, MerchantSuite complies with the globally recognized PCI-DSS. Having the PCI-DSS requires stringent security standards during processing and transmission of cardholder data thereby assuring the users of better protection from credit card data leak. 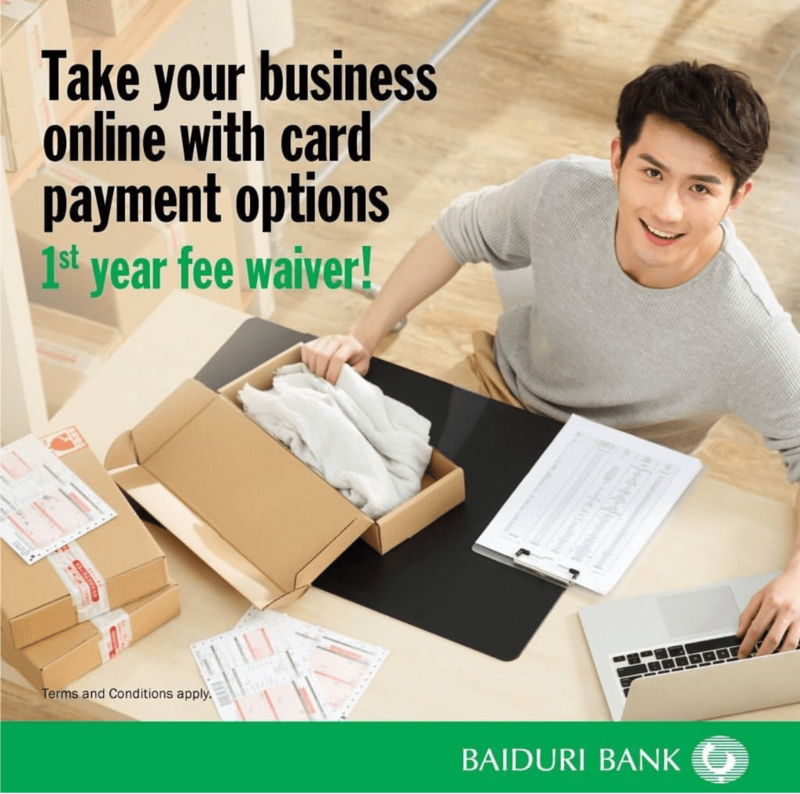 To register for MerchantSuite, customers will need to set up and maintain a company account in Baiduri Bank. Once set up, a simple online registration is required, with 4 tier options available, namely, Bronze (USD60 per year), Silver (USD120 per year), Gold (USD500 per year), and Platinum (USD1000 per year). Those who would like to register for a trial account may simply do so for free. As an added incentive, the first 180 customers who successfully signed up for the Silver package, will enjoy a waiver on the annual fee of USD120 per year. The event continued with a showcase of products and services offered by the Business Banking Unit, Baiduri Bank, that concluded at 4.30pm. Aside from MerchantSuite, the Business Banking Unit under Retail Banking provides support and services to small and medium enterprises (SMEs), such as the Baiduri Internet Gateway System, as well as the Business i-Banking to assist businesses in paperless transactions and assist them in SME credit facilities where eligible. For more information on MerchantSuite, the public can contact Baiduri Bank at 2449666, log on to www.baiduri.com, or find Baiduri Bank on Facebook, Instagram or Twitter.